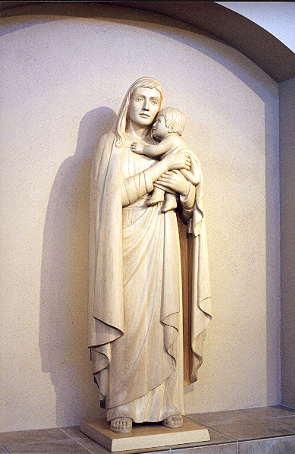 ANDRÉN & KNAPP - STATUES, "Madonna-Orlando"
This life sized Madonna sits in the day chapel of St Margaret Mary Church in Winter Park, Florida. It is made of cherry wood but has a light stain. We also made the cherry wood furniture in the chapel as well as the marble and wood furniture in the main church.